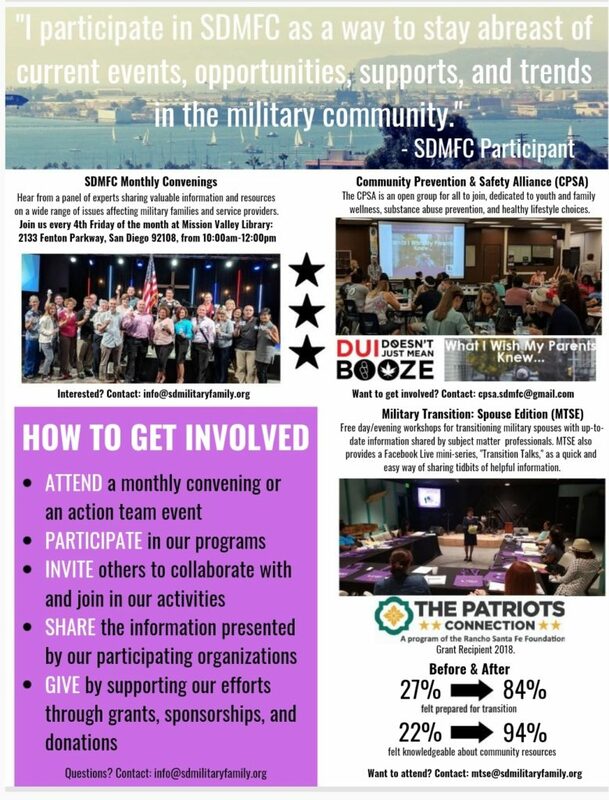 On Friday, January 25, the San Diego Military Family Collaborative hosted its first Monthly Convening of 2019! The topic focused on the results of the San Diego Regional Veteran & Family Wellness Strategy. The report was composed and written by Dr. Kim Hunt of the University of San Diego’s Caster Family Center for Nonprofit and Philanthropic Research, with additional research support provided by AmeriCorps VISTAs working with the SDMFC and the San Diego Veterans Coalition (SDVC). It is the product of last year’s four Community Conversations, which occurred throughout San Diego County, and consisted of Phase One of the project. The goal of this first phase was to create an asset map of available resources and service providers for military families, as well as discovering where saturation of services exist and where there are service gaps (opportunity areas). Check out the FULL REPORT by clicking here! We also briefly reflected on the successes of 2018 – one of our best years yet! Check out the latest SDMFC Impact Sheet below – or download it HERE (front) and HERE (back)! Click here to watch the panel, featuring Dr. Kim Hunt (USD), Danny Romero (SDMFC), and Ron Stark (SDVC)! Dr. Kim Hunt (University of San Diego): Kim Hunt has been active in education and the nonprofit sector for more than 25 years. She is currently a Research Associate at the Caster Family Center for Nonprofit and Philanthropic Research at the University of San Diego (USD). Prior to joining USD, she worked with nonprofits as a business manager, volunteer, communications specialist, and budget analyst throughout the U.S. and Europe. As a Navy Spouse, she moved with her husband and two daughters 16 times in 21 years throughout the US and Europe. Kim’s research focus is on highly mobile military children and their capacity to build resilience. Daniel Romero (SAY San Diego/SDMFC): A native of San Diego, Daniel Romero has worked within the nonprofit sector in San Diego for the last 12 years. Starting as an AmeriCorps member, he began community-focused programs to address the needs of various neighborhoods across Southeast San Diego including. After several years, he connected to additional ethnically diverse communities reflective of Latino, African-American, and Refugee families. While in graduate school at the University of San Diego, Daniel connected to the San Diego Military Family Collaborative, a program developed through SAY San Diego, which supports military families through sharing of community resources and information to enhance military family life. In October of 2016, Daniel entered into his current role as Senior Program Director at SAY San Diego overseeing all of SAY’s military-focused programs. Daniel is a graduate of University of California, Santa Barbara as a double-major graduate in Political Science and Spanish. He has also obtained his Masters in Nonprofit Leadership and Management through the University of San Diego. Ron Stark (San Diego Veterans Coalition): Ron Stark is a Navy submarine veteran of the Vietnam Era, the Cold War Era, Desert Shield, and Desert Storm. Ron holds a Bachelor of Science in Business Management from Christian Heritage College, an MBA from the University of Redlands, and is a Certified Addictions Treatment Counselor IV. He has served veterans and their families for nearly 23 years beginning at Vietnam Veterans of San Diego (1994-2000) and Mental Health Systems (2000-present). His roles at MHS have included Operations Manager of the MHS Alcohol and Drug Services Division, and then as a program manager in San Diego, Imperial, and San Bernardino Counties providing an array of services in drug and alcohol treatment, recovery and prevention, mental health, employment services for homeless veterans, and supportive employment services for individuals with serious and severe mental health disabilities and justice system involvement. Ron is currently program manager for MHS’ North Inland Community Prevention Program (NIPCP) providing environmental alcohol and other prevention services in the San Diego County North Inland Region. He is the 2012-2013 San Diego County Veteran of the Year, the 2013 CA Assembly 79th District Veteran of the Year, and received the 2012 San Diego Psychological Association Local Hero Award. Join us for our next Monthly Convening on Friday, February 22 @ Mission Valley Library, 10:00am-12:00pm!